Amina joined the MDY Legal Development Finance practice in 2015, where she provides legal, compliance and company secretarial services to the Emerging Africa Infrastructure Fund, a multi-million dollar debt fund in the Private Infrastructure Development Group, which aims to address the lack of available long-term foreign currency debt finance for infrastructure projects in sub-Saharan Africa. 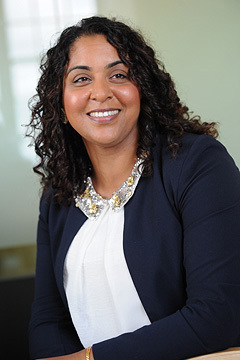 After qualifying at Woodhouse Davies & Martin Solicitors, Amina practised as a solicitor at Colemans-etts Solicitors, as a specialist resolution dispute lawyer in civil and commercial matters, before joining the United Nations Interim Mission in Kosovo. In her role at Bearing Point/USAID, Amina consulted in the office of the Prime Minister, as part of USAID’s economic reconstruction programme. Amina then progressed to Deputy Head of Legal at the Kosovo Trust Agency, practised as Legal Counsel for the United Nations Mission in Kosovo and as a legal expert for the Society of Certified Auditors & Accountants of Kosovo, while holding various lecturing posts at London colleges and consultancies.